Samuel Mastorovich, 85 of Sheffield Lake, Ohio died Monday, September 3, 2018 in the Cleveland Clinic Hospital, Cleveland, Ohio. He was born on December 8, 1932 in Adderly, Pennsylvania to the late Mary (nee: Benckich) and Milan Mastorovich. Mr. Mastorovich graduated from Franklin Regional High School. He lived in Murrysville, Pennsylvania before he made his home in Sheffield Lake forty three years ago. Mr. Mastorovich owned and operated Sam’s Arco in Pennsylvania. He retired from the Ford Motor Company, Lorain Assembly Plant after twenty three years of service. Mr. Mastorovich was a member of St. Thomas The Apostle Church, Sheffield Lake where he served as an usher and an avid volunteer. He was awarded a special recognition by Pope John Paul for his exemplary service to the church. Mr. Mastorovich was an energetic man who never sat down, devoutly prayed, coached baseball and enjoyed the company of his grandchildren and family. He was an ardent Pittsburgh Steelers fan and had a passion for working on cars. Mr. Mastorovich is survived by his sons, Samuel J. Mastorovich of Louisville, Kentucky, Richard A. Mastorovich of Lorain, Ohio and Bruce M. (Donna) Mastorovich of Crestwood, Kentucky, daughters, Teresa M. (Joseph K.) Sabo of Elyria, Ohio and Sandra A. Kirkwood of Sheffield Lake with whom he made his home, brother, Michael (Elsie) Mastorovich of Murrysville, sisters, Mary Vukelich of Pittsburgh, Pennsylvania and Mildred Romanelli of Murrysville and grandchildren, Joey, Doug, Sheral, Brian, John, Sammy, Carletta, Racheal, Matt, Andrea, Bruce, Missy, Zachary, Kayla, Faith (Emily), Ian, Brad, Hugh, Roman, Christian and Jordan, great grandchildren, Sierra, Ashley, Matt, Cadence, Harmonie, Shawn, Samuel, Brian and Jordan and many nieces and nephews. 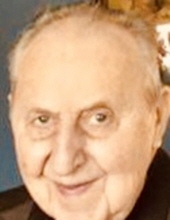 In addition to his parents, he was preceded in death in 2006 by his wife, Josephine M. (nee: Marshick) to whom he was married for fifty one years , his brothers and sisters, George, Merco, Steve, Thomas, John, Betty, Ann, Danice and Martha, grandson, Hughey Kirkwood IV and his daughter-in-law, Carla Mastorovich. The family will receive friends on Friday, September 7, 2018 from 2-4 and 6-8 at the Reidy, Scanlan, Giovannazzo Funeral Home, 2150 Broadway Avenue, Lorain, Ohio 44052. Friends and family will assemble at the St. Thomas The Apostle Church, 715 Harris Road, Sheffield Lake, Ohio 44054 on Saturday, September 8, 2018 at 11 AM where mass will be celebrated by The Rev. Fr. Stephen L. Shields, pastor. Burial will follow in Ridge Hill Memorial Park, Amherst Twp., Ohio. Funeral arrangements have been entrusted to the Walter A. Frey Funeral Home. Online condolences may be sent to www.freyfuneralhome.com. To send flowers or a remembrance gift to the family of Samuel Mastorovich, please visit our Tribute Store. "Email Address" would like to share the life celebration of Samuel Mastorovich. Click on the "link" to go to share a favorite memory or leave a condolence message for the family.